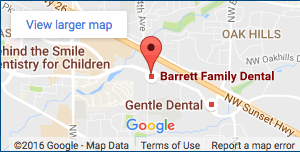 As your family dentist in Beaverton, our team at Barrett Family Dental strives to provide our patients with the best dental care possible. Providing outstanding dental care means embracing new technologies and techniques that enable Dr. Barrett to ensure the health and comfort of our patients always comes first. For the better part of a century, silver amalgam fillings were the best option for repairing cavities caused by tooth decay. However, new technologies that have emerged over the last couple decades has led dentistry away from the use of amalgam fillings. With the creation of new, stronger tooth-colored restorative materials, amalgam fillings have quickly fallen out of favor. Silver amalgam once made an ideal material to use in fillings. Not only was silver amalgam strong, it was also incredibly durable and proven to last for decades. The strength and resiliency of amalgam made it the ideal material for filling back teeth, which receive a lot of pressure and strain from chewing. For years, engineers have refined their formulas for new tooth-colored composite materials and the technology has finally arrived at a place where the strength of composite filings match that of silver amalgam. Combine that with the many benefits of composite and the reasons to use composite materials over silver amalgam becomes pretty convincing. Today, composite fillings simply make a better choice than traditional silver amalgam for helping to protect patients’ long-term oral health. Improved appearance and the ability to blend seamlessly into a patient’s natural smile is the most obvious benefit of using composite materials over silver amalgam. Resin composite materials allow us to match the shade of the patient’s tooth and provide a filling that is nearly impossible to see. When compared to the silver color of an amalgam filling (which oxidizes and turns black) there is no doubt that composite makes a more esthetically pleasing choice. The mechanical properties of composite also allow for a more conservative approach to dentistry. When placing a silver amalgam filling, a dentist is forced to remove not just the decay but additional tooth structure because the material often requires additional thickness to provide adequate strength. If left too thin, amalgam fillings become brittle and will fracture, an issue composite fillings don’t have. Modern resin composite fillings have been engineered to not require additional thickness for improved strength. A dentist can simply remove the decay and fill the tooth, leaving more of the patient’s natural tooth intact. The less tooth removed, the healthier the result. Finally, the use of composites avoids issues with mercury that concerns many patients. As we all know, silver amalgam contains the toxic substance mercury. However, the amount of mercury in amalgam is so minuscule that any risk of exposure is basically nonexistent. Many research articles have been published in peer reviewed journals stating that silver amalgam is safe to use. The research has shown there is a small exposure to mercury when the filling is placed and a small exposure if the filling removed, but in both cases the exposure is well below the threshold to cause any harm. That same research has shown that once the filling is in place and stable, all the mercury remains trapped in the alloy. Even though the placement of amalgam filling present no danger to a patient, there is no reason to expose our bodies to a substance we know to be toxic, even at minimal levels when there is a better alternative. Composite materials contain no mercury, thereby removing any exposure, no matter how limited. The issue with mercury actually becomes more complicated when we step back from looking only at the patient and consider the dental health professionals who assist patients every day. The average patient doesn’t have that many fillings placed over a lifetime. The studies that look at patients show there is no harm to the patient because the exposure over a lifetime is low. However, that is not the case for dental workers. During the decades where amalgam fillings were placed constantly, dental workers were being repeatedly exposed to mercury and it was causing real harm because their exposure level was thousands of times higher than that of patients. In addition to risks for staff, environmental concern exist as well. Every amalgam filling placed produces toxic waste that must be dealt with. We use the industries best filtration system and protocols to prevent this waste from causing environmental issues, but it is always better to produce less waste to begin with. As your family dentist in Beaverton, Dr. Richard Barrett strives to have as green of an office as possible, and reducing the mercury waste we produce is a key element in that. For these reasons, Dr. Barrett has decided to no longer use silver amalgam fillings for our patients. They simply have no place in the modern dental practice. By using composite filings, we have greatly improved esthetics, less removal of tooth structure and no mercury exposure for patients, staff or the environment. All of this and a better looking smile. Now that’s something we can all get behind.